After weeks of high anticipation – tempered by the lows of a possible cancelation, US President Donald Trump and North Korean leader Kim Jong-un finally met on June 12 on Singapore’s resort island of Sentosa. The summit has to some extent dissipated fears of a hot war between the two countries, which had been fueled only months before by Trump’s “fire and fury” rhetoric and Kim’s nuclear and ballistic missile tests. Only time will tell if the meeting will have lasting significance. In the luxury Capella Hotel on Sentosa, at 9:04am local time, Kim, wearing his black uniform, horn-rimmed spectacles and maintaining his trademark short back and sides haircut, in what was obviously a highly choreographed meeting, strode to greet Trump, who walked toward him wearing his usual dark suit and slightly too-long red tie. “Nice to meet you, Mr. President,” Kim greeted Trump in English. They grasped each other’s hands firmly for 12 seconds. Behind them, the national flags of the US and North Korea hung together for the first time in history as their two leaders met. The two leaders started their summit with a one-on-one meeting, joined only by two interpreters. After the personal meeting, which lasted 38 minutes, the two leaders emerged, strolling side-by-side through the grounds of the five-star hotel. “I think the entire world is watching this moment. Many people in the world will think of this as a scene of fantasy… from a science fiction movie,” Kim told Trump through a translator. The two leaders then joined in bilateral talks with their respective delegates before a working lunch. The menu featured a mix of Western and Korean dishes, including beef short rib confit, Korean stuffed cucumber, sweet and sour crispy pork with Yangzhou fried rice, and daegu jorim, Korean soy-braised cod. After lunch, Trump and Kim walked alone through the grounds of the Cappella. Journalists waiting in the press area continuously lobbed questions. Kim smiled but did not answer. Trump said that the results of the meeting were better than anyone expected. 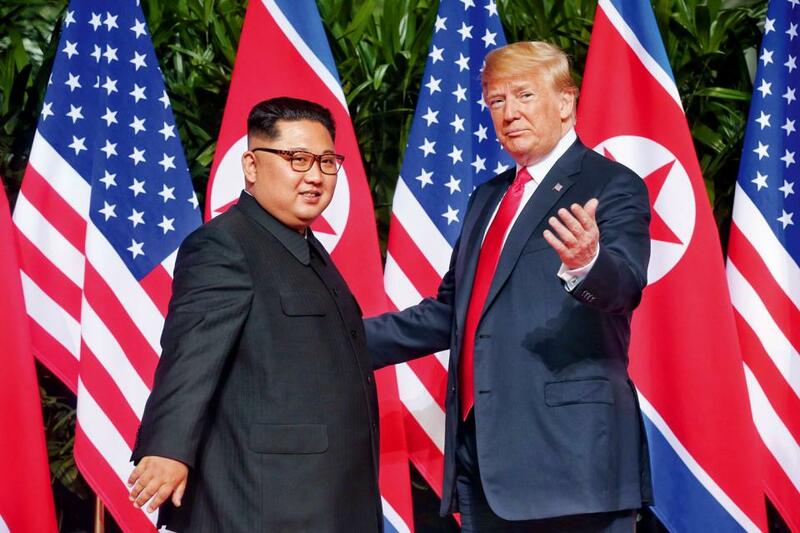 The statement also assured that both countries would establish “new relations” in the pursuit of “peace and prosperity,” and that North Korea would work toward “complete denuclearization of the Korean Peninsula.” The statement included the commitment that the remains of US soldiers missing in action and presumed dead from the Korean War would be repatriated to the US. But there was no mention of the previous US aim of “complete, verifiable, and irreversible dismantlement” (CVID), a longstanding demand of the Trump administration. Kim’s commitment did not go beyond what he had already pledged to do in April when he met South Korean President Moon Jae-in. Both sides have committed to future talks, which would be led on the US side by Secretary of State Mike Pompeo.Trump, after the summit, held a lengthy press conference detailing his discussions with the North Korean leader. The US President described the meeting as “honest, direct, and productive.” He revealed that the North Korean leader had already agreed to destroy a missile engine test site. Trump then sent shockwaves through his own military and Moon’s administration by pledging to end the joint US-South Korean military exercises. He called the exercises “very provocative,” echoing the rhetoric North Korea uses in its propaganda, and “tremendously expensive.” He also mentioned the possibility of one day pulling out the 32,000 American troops stationed in South Korea. Trump saw the summit as “a great moment” in the history of the world, and was buoyant about the prospects of peace on the Korean Peninsula. “We can honor the sacrifice of our forefathers by replacing the horrors of battle with the blessings of peace,” he said. Mere months ago, it would have been impossible to imagine that Trump and Kim would not only meet, but be seen hugging and laughing in public.Tensions had rapidly escalated between the two sides in 2017, as North Korea defied the world with its repeated missile tests, and there was a heated war of words between the two leaders which flew in the face of previous diplomatic efforts. It almost seemed the region could be brought to the brink of war. By May 2017, Kim had launched 48 missiles, surpassing the total number of those launched during his father’s and grandfather’s administrations. The crisis deteriorated as North Korea, on July 4, fired its first ever intercontinental ballistic missile over Japan, which it claimed was capable of reaching the US mainland. The Trump team urged the UN Security Council to impose new sanctions on North Korea in September 2017, including capping its oil imports, banning textile exports, ending additional overseas laborer contracts, suppressing smuggling efforts and stopping joint ventures with other nations, as well as sanctions on North Korean government entities. The same month, Trump mocked Kim in his first address to the UN General Assembly as being a “rocket man” on a suicide mission and vowed to “totally destroy” North Korea if it threatened the US or its allies. expressed a significantly softened tone against the North than had his predecessor, the scandal-hit Park Geun-hye. In the early days of 2018, discussions were held about involving the North in the February Games alongside athletes from the South, and while Trump and Kim were still hogging the limelight, it was Moon who was quietly pushing events which culminated in the summit.